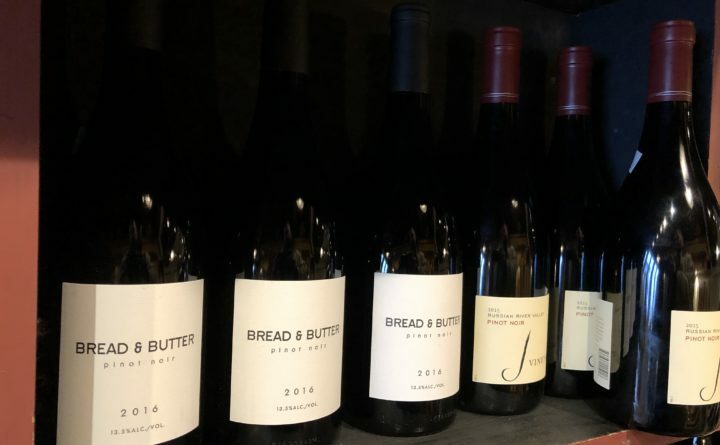 Bread & Butter pinot noir is seen on the shelf of a wine store in Maine. South Portland Wine Co. has been the exclusive wholesale distributor of the brand in Maine since 2013, but is alleging in a federal lawsuit that California-based Winery Exchange is attempting to wrest control of the wine here. Sales in Maine of Bread & Butter brand wines have skyrocketed in recent years. But now that the wine has gotten big, the local wholesaler who “developed a market in Maine” is claiming the brand’s California-based producer is using “subterfuge” to pry the wines away. In a federal lawsuit filed this week, South Portland Wine Co. is accusing Winery Exchange Inc. of raising prices, slowing shipments and trumping up false claims of poor service by the local company in an effort to give Bread & Butter wines to a competitor. South Portland Wine Co. has been the exclusive distributor in Maine for Bread & Butter wines since 2013, and has grown sales of the brand from 55 cases in 2015 to nearly 3,000 last year, according to its lawsuit. A spokesperson for Winery Exchange Inc. — also known as WX — did not immediately respond to a request for comment Wednesday. An attorney representing South Portland Wine Co. — otherwise known as So Po Wine Co. — was not available for comment Wednesday. As an out-of-state winemaker, Winery Exchange holds a Maine certificate of approval to allow its Bread & Butter wines to be transported into the state for sale. But South Portland Wine Co. holds the exclusive wholesale distribution license for the brand in the state, according the company’s lawsuit. The South Portland company claims in its lawsuit that Winery Exchange representatives asked to move the distribution license for the brand to a competitor in August 2018. After South Portland Wine Co. balked, Winery Exchange abruptly increased its prices on Bread & Butter wines and slowed its shipments, going from as few as three days to fulfill orders of the wine to as many as 46, according to the lawsuit. The California winemaker then complained So Po Wine Co. wasn’t keeping up with supplies to grocery stores outside Cumberland and York counties and used the claim to justify switching its distribution over to its preferred competitor, the local company’s lawsuit alleges. So Po argued WX’s claims of inadequate service to grocery stores are “unfounded” and that the subsequent switch of wholesaler, without filing proper notice through the state’s Bureau of Alcoholic Beverages and Lottery Operations, is illegal. So Po alleges the slowed shipments and diversion of wines to a competitor has cost it at least $75,000, and is asking the court to order WX to compensate it for those losses, as well as punitive damages, among other relief.